The Halifax Chronicle-Herald reported in September 2010 that the CAO of the Municipality of Shelburne was eager for a new fish processing plant in Shelburne that was to be in place and operational by the end of 2011. This $150 million fish processing facility to be built by Cooke Aquaculture would produce 350 full time processing jobs. At various meetings and in media interviews, Cooke Aquaculture executives repeated these numbers, assuring others that these were to be full-time, year-round jobs and that there would also be several hundred “spin-off” jobs. 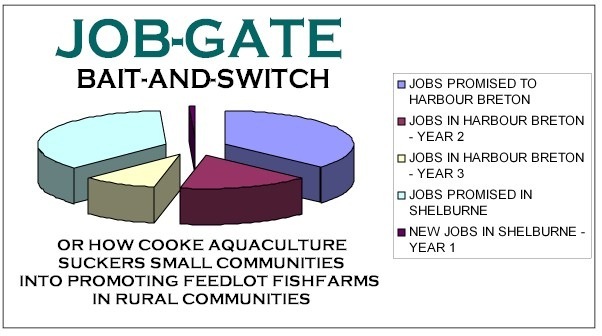 As we all know, the number of new Cooke Aquaculture (Kelly Cove Salmon) jobs in Shelburne County by year’s end came to zero. At the July, 2011 public hearing about three proposed new aquaculture sites in Jordan Bay, Middle Head, and Blue Island, Nell Halse, vice president for communications at Cooke Aquaculture, modified the earlier Chronicle-Herald story by setting a goal of 3 million fish per year in order to move forward with the processing plant project, which included plans for a hatchery in Digby. If you want to know “how many full-time jobs and by when”, you have to determine two things: (1) the number of fish a worker processes per hour and (2) the number of fish to be harvested per year. With automation: Depending upon whether they are heading, gutting or filleting, the newest machines recently installed to great fanfare in Cooke plants in New Brunswick and Newfoundland process from 960 to 2500 to 3600 fish per hour, per worker. Without automation: The claimed number of fish processed per hour per worker varies widely, covering a range from 7 to 26. Even based on “low-automation” figure of 26 fish per hour, per worker, processing three million fish per year – the figure put forward by Nell Halse – would only employ about 60 full time workers. At this processing rate, employing 350 full time workers would require about 18 million fish per year, an 1100 % increase in the total number of farmed salmon harvested in Nova Scotia in 2010. Obviously, fish production at this level is many years off, if it ever occurs. At the other “low-automation” extreme, of seven fish per hour, 214 workers would be needed to process 3 million fish per year. This is still far short of the promised 350 workers. Put another way, at the lowest processing rate of seven fish per hour per worker, in order to reach 350 full time workers, a plant would need to process about 4.9 million fish each year, not 3 million. If the processing rates achieved by the newest automated equipment used by Cooke in New brunswick and Newfoundland come to pass in Shelburne – as Cooke executives say they plan – the number of workers needed to process even 20 million or more fish per year would still be well below the 350 processing job mark set by Cooke and our municipal leaders. Whichever formula is used, having enough fish to justify a plant might not be accomplished before 2016 or 2017, even under the most favourable conditions, and would require many more additional salmon grow-out sites to be submitted to the licensing process across the province. Installing many more cages in the bays and harbours surrounding our coastlines will become increasingly difficult, as new applications are met with fisherman and citizen opposition and what would appear the inevitable lawsuits. In addition, low processing rates such as 7 fish per hour or even 26 fish per hour – make automated fish processing much more economically attractive to Cooke, thereby threatening exactly these numerous low-productivity jobs. The need for many millions of fish per year to assure a processing facility is borne out by Kelly Cove Salmon’s February, 2008 report “Environmental Management Plan” which calls for a production arrangement of three Bay Management Areas (BMAs) of 3,000,000 smolt per year for each BMA, in order “To achieve long term production and [the] economic stability needed to support other service infrastructure, such as a processing plant.” Three BMAs at 3 million fish each comes to 9 million fish per year. So now we have three wildly different estimates of the number of fish necessary to support and sustain even a low-automation processing plant: 3 million fish per year, 9 million fish per year, and 18 million fish per year. There is no excuse for such unexplained wide variations in processing rates, in the number of fish needed to employ 350 workers, and in the start dates for a year-round, 350-person processing plant. Cooke’s fish processing manager in New Brunswick should know the precise number of fish/hour that his workers process. And of course, not to forget, there are credible reports that the highly automated version of a fish plant is exactly what Cooke has in mind for Shelburne. We look to Cooke Aquaculture to provide timely, written, and factual clarifications of these issues and to identify any additional conditions, such as acquiring local and Provincial subsidies that must be forthcoming before a new processing plant might be built. We also look to the government to tell us whether they have seen realistic business plans from Cooke which spell out in detail how many millions of salmon must be grown and harvested to justify a modern, $150 million processing plant which would operate year-round and employ even close to 350 people. An even more fundamental question needs to be addressed now: why do the people of Shelburne have to continue to wait for these uncertain processing jobs? Local people should not have to be dependent on multiple favourable court decisions, the ability of the Province and the Municipality to raise funds to subsidize Cooke, the willingness of the Provincial government and ACOA to hand over tens of millions of tax payer dollars to subsidize a new processing plant, the possibility that the Province won’t grant all the licenses that Cooke is applying for or that hatchery production would be insufficient to fully stock aquaculture sites. 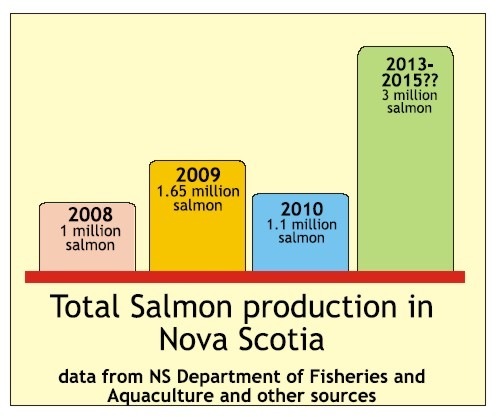 Instead, the Province should make it a policy that all aquaculture fish grown in Nova Scotia waters start with smolts from local hatcheries and be processed in local existing processing plants, which like Cooke’s plants in New Brunswick, are running well under capacity. This policy could produce between 19 to 72 jobs in Nova Scotia now, with much greater certainty, and without further financial burdens on local citizens and their governments. Until new Provincial policy is implemented, we need a moratorium placed on the approval of any new sites in Nova Scotia, including the Jordan Bay, Middle Head, Blue Island, Spry Bay, Beaver Harbour and Shoal Bay sites. People who have signs in their lawns that read CITIZENS FOR SUSTAINABLE AQUACULTURE might consider amending the signs to read: CITIZENS FOR SUSTAINABLE AQUACULTURE – NOW! First of all, I find it slimy that you guys call your group Citizens FOR sustainable aquaculture when you are clearly against this industry. Second, the jobs that you trying to say wont be created, well, you just don’t get it. ANY industry that comes into rural NS will create more jobs than just the plant of farm. They are called spin off jobs. Store owners, electricians, financial, restaurants, etc all create jobs because they would then have clients and customers. Did you ever notice that when a large industry closes, so do most other buisnesses in the area. Third, the ISA out break. Any industry that deals with farming has its dangers. Cows it is mad cow disease, vegtables it is E-Coli, etc. the fact that it was detected and the company dealt with it promptly shows they are responsible. Normally I don’t care about groups like your that make a big deal out of small deals, but after reading your ridiculous newsletter this morning, I felt I had to let you know your inaccurate points and personal views do not change people’s minds and have strengthened my opinions for.